Nexium class action and individual lawsuits are options for patients who allegedly suffered chronic kidney disease, kidney failure and other renal complications due to treatment with the popular proton pump inhibitor. It is important that you contact a qualified attorney if you or a loved one were diagnosed with chronic kidney disease, kidney failure or other renal complications after using Nexium. The legal team at Bernstein Liebhard LLP can help you determine whether joining a Nexium class action or filing an individual lawsuit would best serve your interests. To obtain a free review of your case, please contact our office by calling (888) 994-5118. Nexium is a proton pump inhibitor indicated to treat GERD and other disorders associated with the excess production of stomach acid. 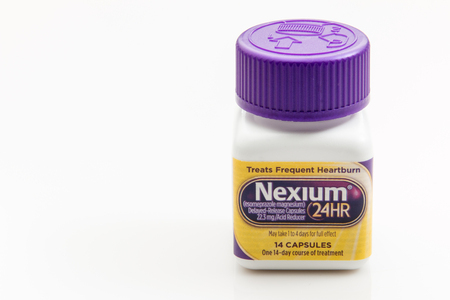 It is available in both prescription and over-the-counter versions (Nexium 24HR). In 2014, the U.S. Food & Drug Administration (FDA) ordered that the labeling for prescription proton pump inhibitors be modified with information about acute interstitial nephritis, a sudden inflammation of the kidney tubules. Acute interstitial nephritis is often the result of an allergic reaction to a medication and can progress to chronic kidney disease or renal failure if not treated appropriately. April 2015: A paper published in CMAJ Open linked proton pump inhibitors to a 3-fold increase in the risk for acute interstitial nephritis, as well as a 2.5 times higher risk of acute kidney injury. January 2016: Research published in JAMA Internal Medicine suggested that long-term use of these drugs might increase the risk of chronic kidney disease by as much as 50%. April 2016: A study published in the Journal of the American Society of Nephrologysuggested that long-term users of proton pump inhibitors may be 96% more likely to develop kidney failure and 28% more likely to develop chronic kidney disease compared to patients using H2-blockers. How Would a Nexium Class Action Lawsuit Work? If a Nexium class action is filed, one plaintiff (designated the class representative) would be given the authority to act on behalf all other class members. Decisions left to the discretion of the class representative include the choice of attorney and whether to settle the claim. Any funds recovered as part of a Nexium class action settlement would be shared equally among class members. However, the class representative would receive a larger share to compensate for their more extensive role in the case. Class action lawsuits generally involve individuals who suffered near-identical damages due to the same product. If the case results in a settlement or judgment for plaintiffs, compensation may include refunds or rebates to reimburse consumers for purchasing the product, as well as funds to establish a program to monitor their health. Patients who experienced kidney injuries allegedly related to Nexium likely incurred physical, financial and emotional damages of varying severity. It’s unlikely that a “one size fits all” compensation scheme that typically results from a class action lawsuit would make these plaintiffs whole. In such a case, fair restitution can only be obtained by filing an individual Nexium lawsuit. The attorneys at Bernstein Liebhard LLP are offering free legal reviews to individuals who may have been harmed by Nexium or other proton pump inhibitors. Please call (888) 994-5118 to discuss your case with a member of our legal team today.